Ok so here's what it's all been working up to then folks, if I were to create a list from the dark eldar codex using the best synergy I could find, what would it look like? Well I'm going to create two lists, for one very good reason - I don't personally use coven units so the first list will exclude things like wracks, haemonculi, talos etc. the second will be a no holds barred free for all. 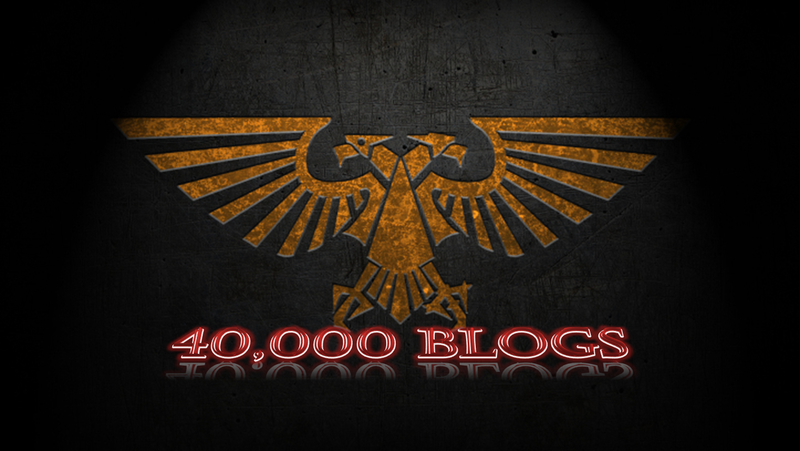 You may have seen my earlier posts about synergy in 40k and how it influenced the creation of my latest army list. That idea also made me think about reviewing my current codices to pick out the synergistic elements (and therefore to see where my army lists are disjointed). 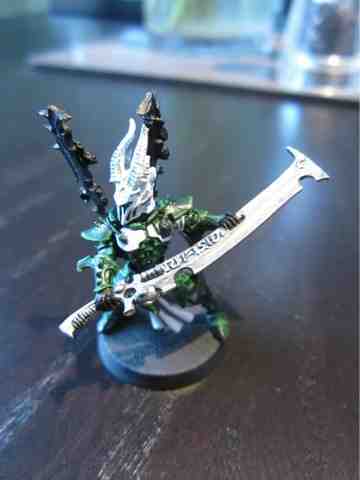 This is Dark Eldar part 6 - HQ. Venom blade: Addresses the Archon's low strength, if it had an AP i reckon you'd see it on every Archon out there. Has very good synergy though in challenges or against monstrous creatures when used with a soul trap. then you move onto your huskblade instead! Blast pistol: The archon does have a ludicrously high BS, so you've got a pretty good chance at hitting what you shoot at. problem is getting close enough to do so. As always, i wouldn't advise relying on it to pop a transport so you can charge the contents. If you're planning on doing shooting with your archon, there are better options plus his high attacks value means you don't always need the pistol/ccw combo. Power weapon: Fairly bog standard, it obviously synergises with a close combat Archon, but is always let down by their basic strength. Blaster: The big brother of the blast pistol i mentioned above, has sufficient range to be a threat without being in realistic charge range. If you put this guy in a unit of trueborn, that's a headache for any tank driver. Doesn't have great synergy with a combat build though (albeit as noted above, his profile attacks do account for this to some extent). Agoniser: Basically a combination of some of the venom blade's wounding power with a power weapon's AP. This obviously synergises well with the combat build, though can be extremely useful when paired with a blaster archon too. Electrocorrosive whip: Biggest drawback to this is that it would be most useful against monstrous creatures, but the archon's basic strength profile isn't capable of wounding most of them, at least not easily. I could see some merit in annoying challenge opponents, but the reliability of wounding your opponent with it in the first place means it doesn't synergise too well with the other options. Huskblade: Probably my favourite of the Archon's weapons, when paired with a venom blade and using a soul trap the Archon can become an absolute beast in the latter stages of a game. As such, it synergises well with the combat build Archon, not so much with the shooty version. Haywire Grenades: Gives the archon a chance to do damage to vehicles without using a soul trap to increase his strength. It synergises well if he's joined a unit also equipped with haywires. On its own, don't bother, you need multiples for the synergy to kick in. Ghostplate Armour: It's relatively cheap, but the main use for this is as a backup if the shadowfield shorts out. So you'll need it, because that shadowfield is tempremental (yes, I've had them last all game, tanking wounds from a carnifex and a horde of gaunts, but I've also had them fizzling out at the first lasgun to even as much as look at it). It doesn't have any particular synergy with anything else however. Combat Drugs: If you've got the points, why not, none of the bonuses are bad, and only one doesn't really change the Archon's performance. It doesn't synergise well however with the shooty Archon, as the title suggests. Soul Trap: Great for boosting your Archon's strength, if you can find a character or monstrous creature for them to kill. Doing that might mean you need the venom blade though. Interestingly, its use isn't limited to combat, so you might be able to pick out a sergeant with your shooting (on a precision shot) to then increase your strength, but that's highly unreliable so it synergises much better with the combat equipped Archon. Djin Blade: Has good synergy with the combat Archon, but ONLY if they also have a shadowfield, the potential to damage yourself without its proection is just too dangerous. Clone Field: Nullifies a random number of hits against the Archon each combat, so works well with the combat Archon. Problem is, you can't take it with a shadowfield so it's only worthwhile if you're fighting something that doesn't ignore your armour save. Shadowfield: Tactically it's practically a necessity for an Archon to have one of these if they're going to set foot outside their transport, and it's pretty important even if they don't. Doesn't synergise with anything else, save to keep the Archon (and his leadership) alive for longer. Conclusion: whatever your tactic, the archon can help you do it better. His shooting options are more limited than combat, but the the likelihood of you using a dedicated shoots archon is less anyway, plus his shooting options don't prevent him from still being useful in combat. Synergises well with the army as a whole, though he works particularly well in some builds such as the pgl equipped archon with an incubi bodyguard. I love the fluffiness behind this idea, that an archon surrounds themselves with assorted advisors, bodyguards and vicious pets. In synergy terms, the court does not have to be deployed with the archon, so doesn't need to be tailored to support their role, but (as with most analyses of the court) the requirement to take a minimum of 1 of each type of creature really hampers their internal synergy. As none of the creature types have any upgrades, in synergy terms i'll look at their roles, and in this instance I'll also look at what I'd do to make them more coherent as a unit. Lhamaeans: This lady holds the most scope for improvement in my mind, as there's little reason to take more than one in their current form. They do enhance both shooting and close combat for the archon, but only if they've got poisoned weapons. The biggest problem here is that the only poisoned weapon the archon can carry for close combat already wounds on the value given by the Lhamaean, so there really is no need for her in close combat. Whilst the buff to wound rolls from shooting are welcome, again it only affects one weapon, and with only one shot and no ap value, the wound benefit is minimal. In order to synergise better, I'd make the Lhamaen's rules the following. 0-3. The first Lhamaean in the units makes all poisoned weapons in the unit wound on a 3+. If a second Lhamaean is present, this increases to a 2+. The third Lhamaean in the unit makes any non-poisoned weapons carried by the archon count as poisoned 4+ (which boosts the electrocorrosive whip and huskblade options to make them more viable). These effects remain in play even if the Lhamaeans are killed or otherwise removed from play as the poisons they provide are distributed before battle. Sslyth: No changes required, including the 1-3 limit. I've left this the same because the way I see it, a bodyguard is the first creature an archon is likely to take into battle. Where I would tweak this slightly is that you may only take more than 1 Sslyth if you have at least one of each other type of creature. Ur-Ghuls: To represent the relentless nature of the Ur-Ghuls hunting down their prey, their charge range (note, not the charge range of the unit as a whole) counts as 2D6+2". As such, the unit is able to get into combat slightly more easily providing they can all still stay in coherency, and represents the court being led into combat by their hunter beasts. Medusae: The rules for their eyeburst talk about paralyzing their victims with waves of anguish, so i was a little disappointed when it just counts as a shooting attack. I'd make them a 0-2 choice, and add in the rule that for every two unsaved wounds caused by their eyeburst attack their opponent gets a -1 initiative penalty. Conclusion: the mix of abilities and attacks makes the court as it is synergise poorly with both its other members and the archon. A few relatively minor tweaks would solve that however. Both these guys have a relatively average statline, which to me says that they're mostly about the upgrades, and boy is it a long list. Hope you're sitting comfortably! Venom blade: Seen it before, if your haemy is going to get into close combat, this is a synergistic option. Stinger pistol: Basically an uprated splinter pistol, it's not going to be game changing, but certainly makes shooting before charging a bit more efficient and so synergises relatively well. Power weapon: Usual problem, Haemies are only S3 so it's tough to wound, more so with their average WS. Synergises ok, but there are better tactical options. Mindphase gauntlet: I like the idea, and it synergises pretty well in a close combat unit in principle, but the main issue is that most of the targets you'd use it against will be striking before you or simultaneously, so in practice it has little use except against a few low initiative units. Would be better if it counted as I9. Flesh gauntlet: Basically it gives you the opportunity to ID stuff without needing to worry about their toughness. Problem is most things you'd want to use it against will be getting a save. Some synergy therefore, but limited. Agoniser: Seen it before, a decent all rounder if your Haemy is in combat. Electrocorrosive whip: Same as before, annoying more than dangerous, it suffers in the Haemy's hands for the same reason as the Mindphase Gauntlet. Huskblade: Literally exactly the same benefits and issues as for the Archon. Animus Vitae: Decent choice for boosting unit pain tokens without having to wipe anything out, it synergises very well therefore. Casket of Flensing: Everyone's favourite(?) most random weapon in the game, its limited range means it only really synergises with combat builds. It has the potential to be devastating, which is also a problem as it can leave you stranded in the open. Liquifier Gun: Best used in multiples and to defend against charges, it synergises pretty well if your Haemy is in a unit of Wracks, not so much if you're looking to stay at a longer range. Soul trap: Not quite as useful as on the Archon due to the lower Ld of the Haemy, but otherwise synergises well in combat. Vexator mask: Might keep you Haemy alive for a little bit longer, but as the test required is unmodified, I'd expect most things to pass more often than not. As such it falls into the irritant category rather than highly synergistic. Scissorhand: If your Haemy is in combat, I really can't understand why you wouldn't want this, it synergises extremely well and actually can make a Haemy pretty in a fight. Archangel of Pain: Another leadership based toy, so it's not likely to do much against most armies, it synergises pretty well if it works, but that's not going to be often. Hexrifle: Turns your Haemy into a sniper, which can be fun, particularly in an objective-sitter unit. Shattershard: Most effective against, erm, Eldar and Dark Eldar. Probably best not to bother using it against anything T4 or higher as you'll really struggle to do any damage. Doesn't really synergise with anything but close support untis due to its limited range. Crucible of Malediction: Even worse than the other leadership based toys as it targets on psykers, who generally have high characteristics here. Would synergise well if the test were on 3D6. Orb of despair: One use only and with only a small blast it's unlikely to affect the game much. It's got limited synergy with anything else your Haemy might want to be doing, and will only work if you're very close. Dark gate: The limited range and large blast template means this is a very dangerous weapon. To yourself. Synergises well if you're facing a horde army, but even then it's let down by being one use only. Limited synergy. Webway portal: Probably the most common piece of wargear carried by a Haemy before 6th hit, it's less prevalent now, but if you're running that suicide charge to get a WWP far up the table, better to do it with a Haemy than an Archon! Conclusion: The Haemonculi are most used to provide pain tokens to other units (something I have a few fluff issues with, but let's not go there) it then can be useful to buff a combat unit as kind of a 'super sergeant' through something like a scissorhand. It has lots of options with limited usefulness on the tabletop, but there are a few gems in there if you look hard enough. Ok so if you thought the archon had good stats, this lady's combat profile is positively obscene. Half the time you win a combat you'll not even have to roll the dice to run down your opponent, and she'll average more hits than some characters can roll to start with when she charges. As ever the main disadvantage is her toughness, but there is literally nothing you can do about that as she's stuck with her basic armour save and no way of upgrading it (that's GLASS hammer). Venom blade: a cheap upgrade option, it makes the most of her attacks and negates her poor strength, it synergises well. Power weapon: less synergy here, you're fine against anything with toughness 3 but as soon as you hit that extra point, you're cutting down your wounds a lot! Agoniser: as with the archon, this option takes the strengths of the venom blade and the power weapon and combines them, and for that reason it's probably the most common option you'll see. Electro corrosive whip: anything that reduces the strength of the incoming attacks is good, but you have to wound them using your basic strength first, which for the reasons stated above is not guaranteed. Some synergy, but not much. Hydra gauntlets: my personal favourite, this means that you can potentially roll twelve attack dice if you get the right combat drug roll. Without an ap value though it's definitely best left to bullying basic troops units. Synergises well I think with a unit of bloodbrides maxed out on hydras too, which can lead to 72 attacks on the charge, which I think you'll find would give even terminators cause for concern. Shardnet and impaler: I wouldn't say this synergises too well, as you're never going to really drop enemy attacks low enough to make the most of it with your HQ likely to be fighting theirs. It's best left to more lowly models. Razorflails: these also have some effect at minimising the lack of strength and for that reason they synergise well. Lack of ap might see you looking elsewhere in efficiency terms though. Blast pistol: sure, if you're not going for wych weapons then take a blast pistol, but as elsewhere, don't rely on it to pop you a transport in order to charge something, cos the dice gods are cruel. Haywire grenades: yes it has synergy if the rest of the unit have them and are going tank hunting. If you're on this trip though, don't bother with other combat upgrades. Personally I think tank hunting is a waste of the hq when basic wyches do it just as well. Conclusion: she's a dedicated combat character, and most of her options enhance that role. Synergises particularly well with units of wyches and bloodbrides but is at home with almost any combat unit. You may have seen my earlier posts about synergy in 40k and how it influenced the creation of my latest army list. That idea also made me think about reviewing my current codices to pick out the synergistic elements (and therefore to see where my army lists are disjointed). 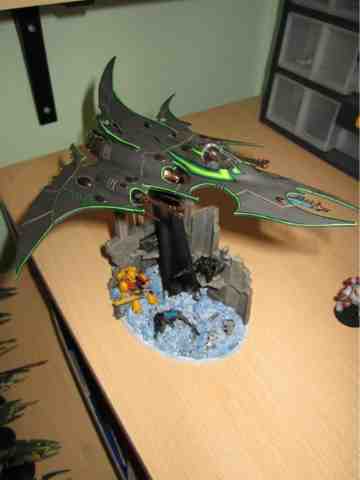 This is Dark Eldar part 4 - heavy support. Probably the most commonly taken heavy support choice in the Dark Eldar army, its weapon loadout comes in two flavour, dark lances or disintegrator cannons. The wording in the codex is such that you can take any combination of these two weapons. I don't think I've ever seen a list where the weapons are mixed however, and that's down to one reason, synergy. Dark Lances are specifically intended at killing vehicles, and although they are better at killing lighter (AV10, AV11) units, the lance rule means that you make AV13 and 14 much less tough. That being said, if you do run out of tanks to shoot at, a dark lance does a passable job of taking on infantry and monstrous creaturs due to its high strength. this is strictly a secondary option though. Disintegrator cannons however specialise in targetting heavy infantry, especially terminators. their high rate of fire and low AP means that if you get a terminator unit in their sights, take aim and enjoy yourself. the comparatively low strength of a disintegrator means it's of little use against vehicles however, and so a mixed weapon loadout really doesn't synergise well. Ravagers get a nice long list of vehicle upgrades to choose from however, so let's have a look at those too. Shock prow: I wouldn't even consider it. the longer range of the weapons on the Ravager means you'll pretty much want it to be sitting in your backfield and not ramming other tanks with it. This is bad synergy! Torment grenade launchers: These provide a nerf to your opponents's leadership, but at an incredibly short range. Synergistically speaking, the only time it would work is if you're looking to break an enemy unit that's made it into your deployment zone and is threatening the Ravager itself. Again, doesn't synergise particularly. Enhanced Aethersails: These allow vehicles to move an extra distance, at the expense of shooting. Synergistically therefore, for a vehicle that has no transport capacity and is there purely to shoot, it doesn't work well. This is exacerbated by the fact that Ravager can shoot all of their weapons even if they move 12". Retrofire jets: Do you really want to deep strike your Ravagers onto the table and waste at least a turn of shooting? This option simply decreases the damage a ravager can do and so doesn't synergise at all. Chain snares: These have some synergy with torment grenade launchers, but in the Ravager's case, you don't want to be that close anyway, so again it synergises poorly. Grisly trophies: On the face of it, as before the short range of the effect doesn't appear to synergise well with the Ravager sitting at the back of the table. Think again though, and you'll perhaps realise that if one of your units should fail a morale check and fall back, the Ravager is fast enough to get close to them to allow them to re-roll any other failures. It's definitely a luxury, but for its cost if you've got the points to spare, it may keep a unit on the table for you. Envenomed blades: Petulant at best, taking envenomed blades assumes your vehicle is going to get charged at some point, and once again as Ravagers have extreme mobility whilst maintaining maximum firepower, this shouldn't happen to you very often. No synergy at all. Night Shields: now we're talking a bit more. Granted, the Ravager is at least immune to bolter fire unlike the raider, but this does allow you to trade fire with similarly ranged units without too much fear of retribution, and can really scupper anyone carrying a multi melta. Flickerfield: Under 5th edition this was a gimme, you just wouldn't see Ravagers without them. Now thanks to jink they're less common, and at 10 points the upgrade is relatively costly for its usefulness. But on those occasions when your opponent pulls out the big guns early and gets the first turn, even a 1 in 3 chance of saving the damage is good odds! Conclusion: The ravager is one of the most common sights in a dark eldar army, but its options leave much to be desired. In particular i feel some kind of upgrade to allow '1's to hit would be well used, and I'm sure if that made the guns count as twin-linked you could bump the cost of that sort of upgrade and still see it taken regularly. Not used this guy before, but here goes. Looking at the profile, clearly the main focus of the model is close combat. As a monstrous creature however, it counts as relentless and so can fire its twin linked splinter cannon to full effect. As an aside, this is the only model i can see that gets a decent twin linked weapon in the entire DE codex (razorwing gets a twin linked splinter rifle, but who doesn't upgrade that to a splinter cannon?) The gun is largely a distraction though i think, and is far more use as something to do whilst getting into contact rather than the main use. Extra close combat weapon: Duh, yes please. Combat unit with only one combat weapon? I think i'll take the extra one. Good synergy. Twin-linked liquifier gun: Is not a close combat weapon, so removes that extra attack you've just got for taking a second. As a template weapon it does have good damage potential though, and when you're generating D6 attacks, doing a bit of damage before you get into combat doesn't seem like a bad idea to me, so I'd say that although it reduces the direct damage you're likely to do, the damage it can create in other phases means it does synergise relatively well. Ichor injector: Best used when taking out lower toughness models, it's cheap enough to give it a go if you're looking to make points up, but given the Talos' strength, the models it works best against are more likely to be suffering instant death anyway. As such, it synergises reasonably with the purpose of the unit, though unless you really can't find anything else to spend points on, I'd leave it at home. Chain flails: Definitely synergises well with this unit, D6 attacks is great, but to roll 2D6 and pick the highest means you're much more likely to be able to rely on the Talos to do some damage (think of it as a kind of fleet for combat). 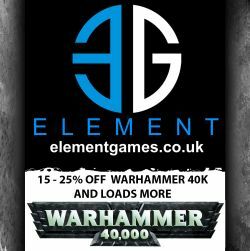 Stinger pod: Decent enough against most things, the stinger pod is a throwback to the previous codex, but against toughness 3-4, poorly armoured units (ie other dark eldar, Imperial Guard etc) it should perform better than the splinter cannon. Twin haywire blaster: On the basis that you can never have too much anti vehicle in Dark Eldar lists, this weapon makes sense. Problem is it's only ever going to help other units really, you can't rely on rolling a 6 for your haywire, so you're only really going to take off one hull point at a time, and it then restricts your assault to the unit you shot at, so I'd say it's not got the best synergy. Twin heat lance: More like it, the heat lance at least has the potential to bust open a transport so you can charge the soggy stuff inside, but the difficulty is in getting it close enough to work its magic. It does synergise with the purpose of the Talos, but you need to think about what tactic you're going to use to get it that close. Conclusion: The Talos is definitely a close combat orientated unit, and the options tailored to this phase of the game synergise well. Caution must be exercised however when thinking about its ranged armament as these combine less well with and can distract you from its primary purpose. Yes, it's a monstrous creature. No, it certainly isn't meant for close combat. It has a split personality however in terms of its weapon options. Its basic armament is the spirit syphon, which is a template weapon. So problem number 1 is that we've got a shooting unit that has a weapon range small enough to mean that it will be in charge range of anything it's shooting at. And what that means is that your opponent can chuck a cheap unit at it and reasonably expect them to bog it down in combat. Its basic weapon therefore synergises poorly with its actual purpose, and the only ameliorating factor is that you're likely to be keeping at least one other unit within 12" to get the benefit of its pain token distributing ability. Spirit probe: Really not sure what this is intended to achieve, with only two attacks at such an average WS, it's perfectly possible that you could spend rounds of combat without achieving anything to use this upgrade with. Doesn't synergise at all well. Spirit Vortex: It's a comparatively expensive upgrade, and brings the Chronos to the level of the Talos points wise, but it's the only option that synergises at all well with the unit's main purpose. It has a much greater range than the syphon, and means that you can stay out of assault range of most things whilst using it, and it should hit a lot more models than the syphon too. As an added bonus, if your opponent does get too close, because this is taken in addition to the syphon, you get the possibility of sharing out two pain tokens in that turn, not just the one. Conclusion: The Cronos is a support unit that is intended to enhance your other units resilience faster than would otherwise be the case, and doesn't rely on wiping units out to gain those pain tokens. As such, in purpose it synergises well with a coordinated assault. The drawbacks however are that it's comparatively slow, meaning staying close enough to make use of its abilities is difficult. Added to that the fact that only the most expensive upgrade option makes the unit work, and its synergy could really only be described as average at best. I'm dealing with these two together as they're very similar in both purpose and upgrades. Obviously as flyers they have no close combat potential. All of their upgrades address their long range damage options, with the vehicle upgrades reducing the damage that can come their way. All of these options synergise well with the units therefore. You may have seen my earlier posts about synergy in 40k and how it influenced the creation of my latest army list. That idea also made me think about reviewing my current codices to pick out the synergistic elements (and therefore to see where my army lists are disjointed). 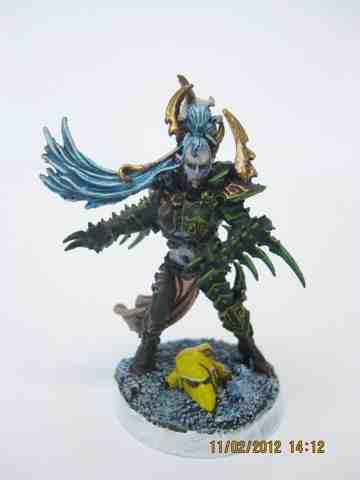 This is Dark Eldar part 5 - Special characters. This is going to be slightly more brief than the last four episodes due to the way characters work, but hopefully it'll still be worth a look. played my first game against the Tyranids last week, and although we only got three turns in, I thought I'd put a brief report together with a few thoughts as to what i did right and what wrong, and how i'd improve things next time. 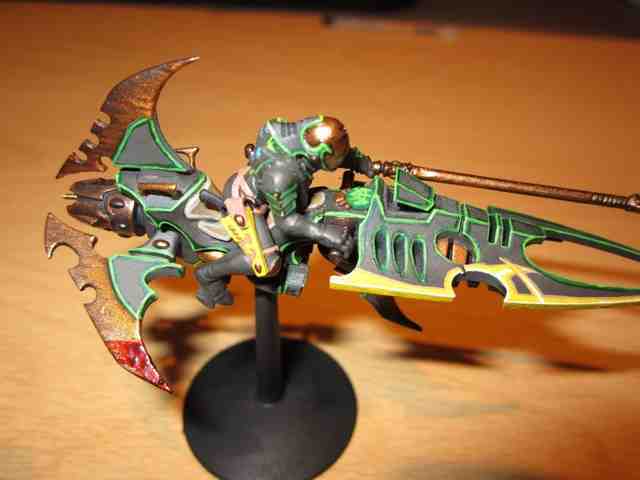 Hi guys, bit of a new type of post for me here, it's a breakdown of how I went about painting one of my Dark Eldar HQ's, the Succubus. First step therefore was to assemble the model, and in this regard I decided to go with wych weapons, and my personal favourite has got to be the hydra gauntlets, so out went the weapons from the original kit and in came a pair of the wyches gauntlets. They're not particularly threatening on their own, but given that her purpose is to sit in my unit of bloodbrides, who also max out on the gauntlets, their damage potential is huge (a bucket is required to roll all the attack dice). Plus I think you'll agree they look awesome. This is a topic I've touched upon in several of my earlier posts in one way or another, and I figured it was about time I sat down and set out what I really mean by the concept of synergy, and how i think it should be taken into account when deciding what units to take in our armies. You may have seen my earlier posts about synergy in 40k and how it influenced the creation of my latest army list. That idea also made me think about reviewing my current codices to pick out the synergistic elements (and therefore to see where my army lists are disjointed). 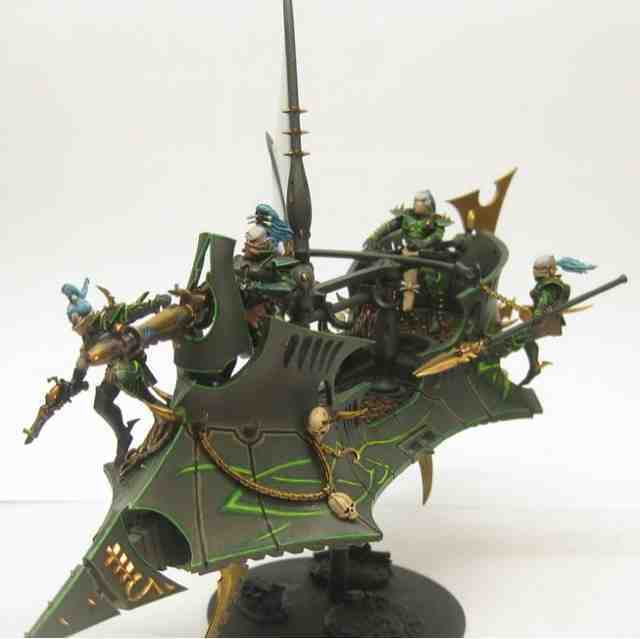 This is Dark Eldar part 1 - Troops. We've all got them, those little gremlins in our collection. I have actually been known to throw away the worst of my collection (pre-ebay) when my painting improved beyond a certain standard. I think my worst-ever figure was a skaven warlord, who i decided to paint using every colour in my collection. It ended up looking less like a savage rat-like warlord and more like my brother after the paintball session on his stag-do.